Hone your tournament play by competing in tournaments! Compete in tournaments for fun or for cash. Send tokens to your friends so they can compete with you, or to your favorite streamers to entice them to play in a tournament at no cost. If you want to perform at the top level you need to play at the top level. Twitch Streamers: Higher Visibility & More Viewers - Tournament play is way more interesting than watching 'standard' content. Host a tournament and get paid to manage it! Host a tournament and get paid to do it. Hosts take a 15% cut (pay-to-enter) just for organizing and managing a tournament. 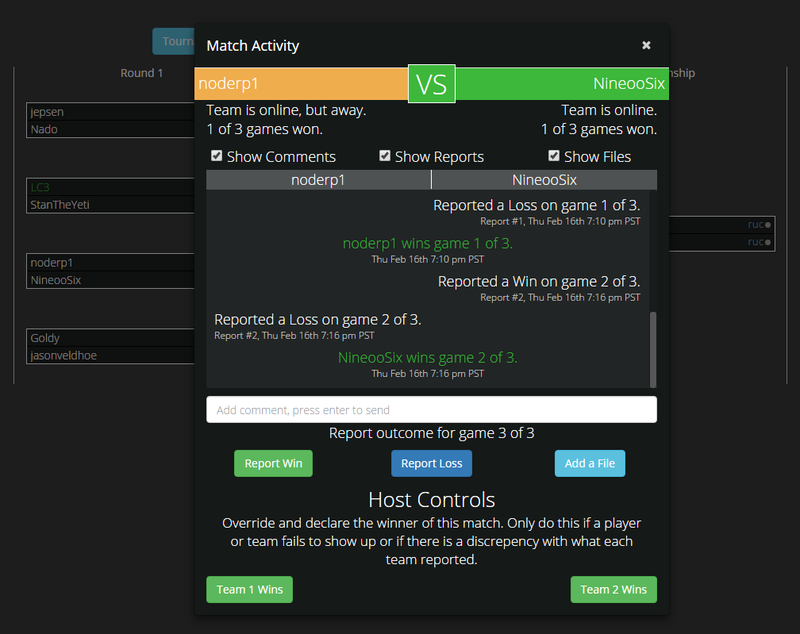 Managing a tournament easy with our built in controls to resolve match issues. Twitch Streamers: Increase Viewer Engagement - Host a tournament for your viewers to directly engage with them in-game by spectating their matches. Build a novel revenue stream on top what you're already doing, streaming. Use the form below to write us a message. If we are unable to answer your call please leave us a message with your name, email, and how we can assist you.